Hello Glow Rice & Milk Facial Cleansing Powder by Rose Link UK - Review & Usage Guide | Sahrish Adeel - Malaysia based Pakistani Beauty & Lifestyle Blogger! I have been exfoliating my facial skin on regular basis since I tried Dermalogica's Microfoliant (review here). I have felt that mild exfoliation on regular basis keeps the skin smooth and healthier than exfoliating the facial skin once or twice a month. When I got this Rice & Milk Facial Cleansing Powder, I was really looking forward for good results since I really like natural products for my skin care routine. Let's see if this product impressed me at all. They say: 'A luxuriously hand blended silky powder, that glides over skin to cleanse and polish. 100% natural combination of pure milk powder, honey, rice and essential oils. Pour onto wet hands, rub palms together to create a smooth paste, gently massage onto skin for 20 seconds and rinse off with cold water to reveal a radiant complexion. (These usage instructions are provided by the company. Find out my personal usage preferences/guide below). 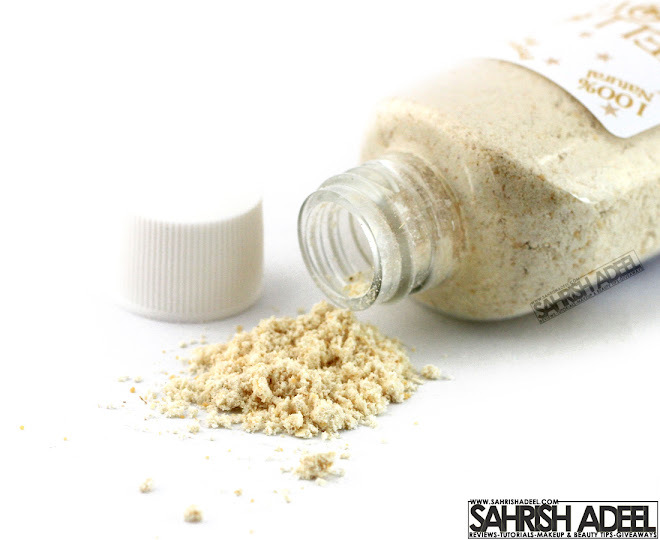 The product is in powder form and comes in a transparent plastic bottle with screw cap. The label is waterproof and the screw cap keeps the bottle air tight and product safe from moisture. Each bottle contains 100ml of product. Removes all dirt and dead skin. Helps to lighten dark marks/spots from skin. Does not give tightness to the skin. You can smell every ingredient but it is not too much. People sensitive to smells can also use this. Non irritant if not used everyday. Air tight bottle and waterproof label. Should contains some ingredient that makes leather on contact with water; making it less harsh for everyday use and saving time. I really like skin care products that do not take extra time since I can't take out enough time for my skin everyday and by the end of the day, I just want to sleep. When I received this product, I was really excited to try it but the smell felt really strong. I then held my breath and applied it on my face. To be honest, the smell was really light and I cannot use products with heavy smells, they just make me nauseous and I am also allergic to intense smells. I started using it everyday but then I noticed some breakouts. Also, I started getting redness after every use. I stopped using it on daily basis and started using it twice a week and that worked fine. After every use, my skin feels instantly smooth and soft and I can clearly see the clean skin. My marks usually go away really fast but since I am using this, I noticed that they are getting lighter really quickly now. I also noticed that I had a few visible pores around my nose area and they have shrunken visibly. Product description says that it has anti-aging ability but since I don't have fine liner or anything, I can't say if it works or not. Overall, I am pretty happy with this product. I am going on a holiday soon and I am definitly taking this with me in my handbag because it is 100ml bottle and a powder product which makes is airplane friendly as well and I don't have to worry about it being spilled in my bag. I usually use it 2-3 times a week, depending on how much my skin has been exposed to makeup, dirt etc. I just wet my face and palm, take about one teaspoon of the product in my palm and make a paste. Then I just rub my hands together and message it all over my face leaving eye area. I also use it on my lips. If I am feeling that my skin does not need that much cleansing but I still want it to be smooth and clean using this product, I mix it with my face wash. I wet my hands and face, add a pea sized amount of face wash and about half a teaspoon of cleansing powder. I rub my hands together and just message all over my face. This is my favorite way to use it since it saves my time and make the product less harsh on my skin. The face wash I am using contains lemon extract so it keeps my skin shine free for even longer hours. This method is the rare one but I still find it good. Sometimes when I have layers of makeup on my face, I quickly wipe everything using a cotton pad and a bit of cleanser. In my next step, I wet my hands and face, mix cleanser and powder in equal quantity and just message on my face. It removes the makeup even better. But I do not use this mixture around my eye area ever. It is really important to exfoliate your skin regularly if you want smooth foundation application. I will highly recommend this product to everyone who is looking for a cleansing powder that has multiple benefits. But if you have super sensitive or acne prone skin, still give it a try but try to mix it with a face wash.
Each bottle of Rice & Milk Face Cleansing Powder costs £9.99 and you can buy it online from Rose Link UK. This product is also available in Pakistan at Just4Girls.pk.